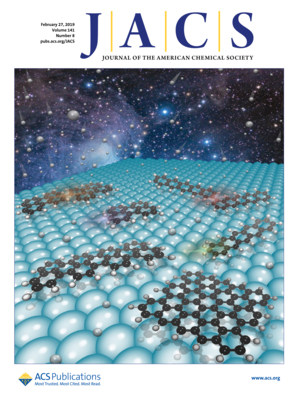 Members of the Nanocosmos team from the ICMM-Madrid (ESISNA Group of the Institute of Material Science of Madrid), together with other researchers, have published an interesting paper in the JACS, Journal of the American Chemical Society: Atomic hydrogen makes the difference. The supply of atomic hydrogen during the on-surface annealing of PAHs substantially favors the formation of intermolecular covalent C–C bonds. The reason resides in the radical-like intermediate formed as a consequence of molecular super-hydrogenation. Read more about those interesting results in the paper “On-Surface Hydrogen-Induced Covalent Coupling of Polycyclic Aromatic Hydrocarbons via a Superhydrogenated Intermediate“, one of the Supplementary Cover Art for the Journal of the American Chemical Society (February 27, 2019). Here is the link to the website and the link to the paper. Congratulations to the team! 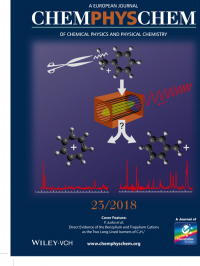 The picture, which is a cover of the journal ChemPhysChem, schematizes the production of the C7H7+ ion by dissociative ionization of toluene and the identification, by infrared spectroscopy, of the two isomers produced: the cations benzylium (right) and tropylium (left). Experiments driven by an international team involving the Institute for Research in Astrophysics and Planetary Sciences (IRAP, Université de Toulouse/CNRS) and the Laboratory of Quantum Chemistry and Physics (LCPQ, Université de Toulouse/CNRS), enabled to identify the two stable isomers of C7H7+ ion. The ion C7H7+ is a well-known species in mass spectrometry, formed by ionization of hydrocarbons such as toluene. The two most stable structures proposed for this ion are benzylium and tropylium ions. The first (a benzene with a methylene group) could be identified by its chemical reactivity, but is not the case of the second, whose structure consisting of an aromatic cycle of 7 carbons is predicted by quantum chemistry calculations. Two structures have been identified for C7H7+ and the vibrational spectra obtained are in agreement with those of benzylium and tropylium ions calculated with the density functional theory. In addition, measures in depletion helped to show that no other isomer was present and this for different precursors used in the production of C7H7+. The study took advantage of the FELion line, installed on the free electron laser FELIX, in the Netherlands. 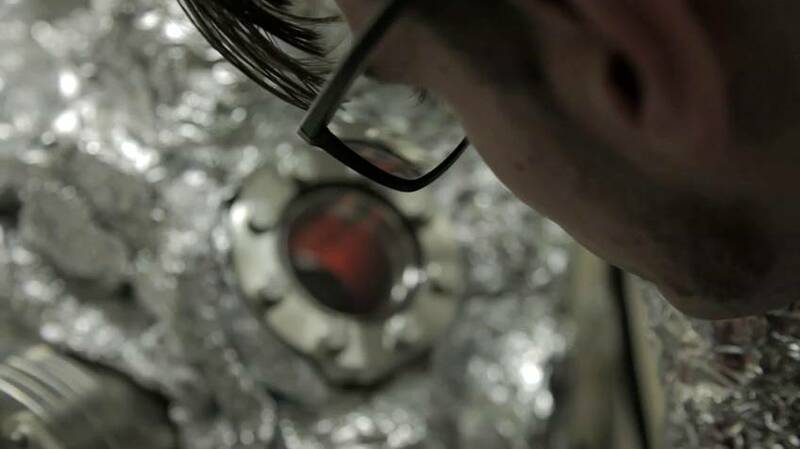 FELion includes a cryogenic ion trap that allows attaching an atom of rare gas on the ions studied. This technique of tagging allows to implement a spectroscopy of action by dissociating the complexion/atom of rare gas with a single infrared photon unlike the technique usually used of multiple absorption of photons to attain the threshold of dissociation of the ion. This technique has the advantage to probe ions without heating them and so without disrupting their structure through processes of isomerization. This work of identification of C7H7+ isomers opens up prospects for the study of the growth paths of the hydrocarbon ions in complex environments both on Earth (chemistry of flames, and plasmas) or space (interstellar chemistry and planetary atmospheres as Titan’s). 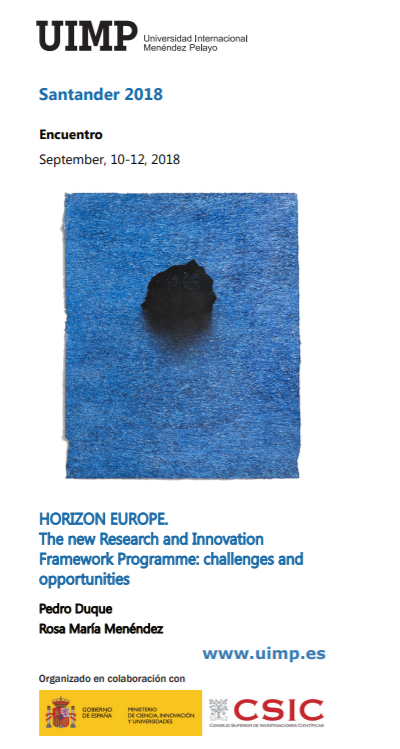 This interdisciplinary work (INSU/INP/INC) has been initiated as part of the ERC Synergy NANOCOSMOS project in collaboration with the CSIC (Madrid) and involves a collaboration between the universities of Toulouse and Cologne as part of the European Training Network (ETN) EUROPAH. Some news from the young team surrounding our PI from Toulouse, Christine Joblin. 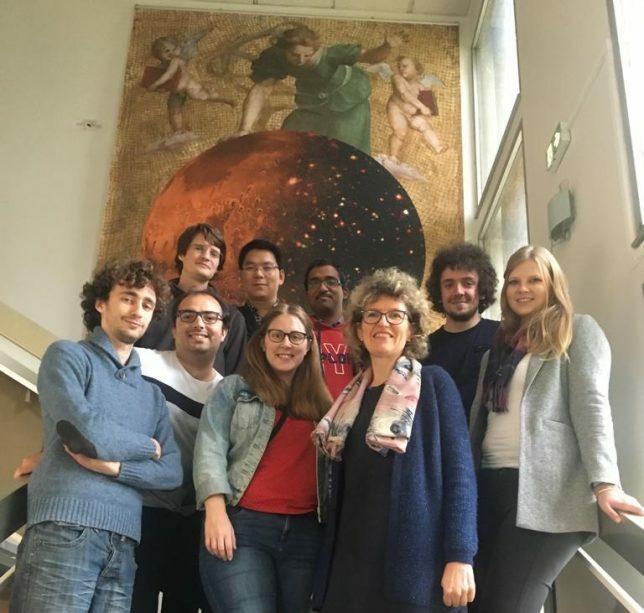 Sarah Rodríguez Castillo (third on the left, first row) presented on October 30th 2018 her PhD thesis entitled “Study on the dissociation of astro-PAHs”, that was carried out at the University of Toulouse/CNRS in the framework of the Nanocosmos projet. Congratulations on this great achievement, Doctor! Polycyclic Aromatic Hydrocarbons (PAHs) are revealed in astrophysical environments thanks to their characteristic infrared emission after these molecules are subjected to the vacuum ultraviolet (VUV) radiation from nearby massive stars. This interaction regulates their charge state, stability and dissociation mechanisms, which in turn affect the energy balance and the chemistry of the gas in the interstellar medium. In particular, PAHs could contribute to the formation of the most abundant molecule, H2, in photodissociation regions (PDRs). This work aims at contributing to these topics by quantifying the VUV photoprocessing of specific medium-sized PAH cations through experimental studies complemented by computational investigations.The experimental results were gathered from two campaigns at synchrotron facilities: ion trap experiments allowed us to obtain the yields of ionization and fragmentation and the branching ratios between the different photoevents, while from iPEPICO spectroscopy we obtained breakdown curves and RRKM-fitted dissociation rates. We detail the case of the fragmentation processes of two isomers of dibenzopyrene cation (C24H14+) in order to assess the impact of structure on these processes. We present Density Functional Theory calculations and Molecular Dynamics simulations, which evidence the relevance of structure and planarity in these mechanisms and provide a better view on the dissociation pathways and energetics.This work brings significant new data for models that describe the chemical evolution of PAHs in astrophysical environments, including the first measurement of the ionization yield of medium-sized PAH cations as well as several dissociation rates. We also report a new mechanism, involving specific structures with bay areas, that would need to be considered while evaluating the contribution of PAHs to the formation of H2 in PDRs. Prof. Cernicharo (NANOCOSMOS PI) has been awarded the 2018 Gold Medal of the Spanish Royal Physical Society and BBVA Foundation for his outstanding merits, impact and leadership in Molecular Astrophysics at the international level. Congrats! 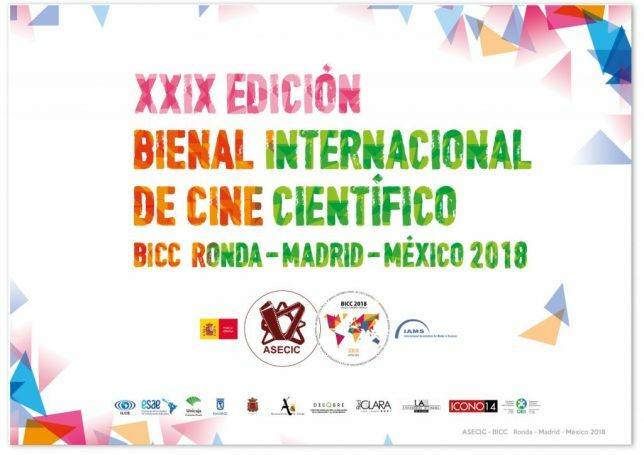 BICC is the acronym for “XXIX Bienal Internacional de Cine Científico Ronda-Madrid-México 2018”, the biennial international event for science movies. Our documentary “NANOCOSMOS: Un viaje a lo pequeño” has been selected as finalist in this contest within the category of “Science documentary”. We are very proud to do our bit in science communication! Even if we don’t get any prize, we acknowledge the jury for considering our movie for the contest. We will stay tuned for the date of the ceremony. Let’s cross fingers! Link to the BICC press release (in Spanish). The Stardust machine has been constructed to simulate the formation of dust grains in the atmospheres of Asymptotic Giant Branch Stars (AGBs), their evolution and further interaction with the ambient UV radiation. On May 8, 2018, the first paper on the NANOCOSMOS Stardust machine has been published at the “Scientific Reports” journal (Scientific Reports, volume 8, Article number: 7250 (2018)). After almost 4 years of hard work at the Instituto de Ciencia de Materiales de Madrid (ICMM-CSIC), the article comprises the stages of the design, development, commissioning and first-light experiments of this innovative experimental station. Stardust integrates a precise tool to fabricate high quantities of complex nanoparticles, perform in-flight manipulation and in-situ characterization, all through five Ultra-High Vacuum (UHV) modules assembled. 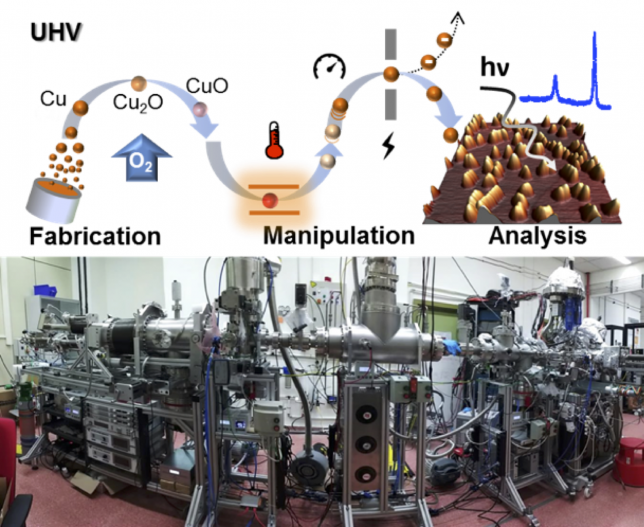 The article presents the precise fabrication, manipulation and in-situ analysis of Cu nanoparticles, as part of the commissioning of the machine. – The new design of the scaled-up Multiple Ion Cluster Source (MICS) addresses a significant step-forward towards industrial implementation of gas aggregation sources, for applications with special requirements such as controlled purity, size distribution, stoichiometry and structure of the nanoparticles. – First-time accurate control of the Cu oxidation state through reactive sputtering using gas aggregation sources that avoids poisoning of the target by injecting large amounts of oxygen. – Integration of several techniques that combine the fine control of nanoparticle fabrication with high throughputs, in-flight manipulation (i.e. : gas injection at different stages, heating, accelerating, …) and in-situ characterization (electron spectroscopy techniques and thermal desorption spectroscopy). This research was presented in the paper “Precisely controlled fabrication, manipulation and in-situ analysis of Cu based nanoparticles“, published in Scientific Reports 8, 7250 (13pp), 2018 May 8. The authors are: Lidia Martínez (Instituto de Ciencia de Materiales de Madrid, ICMM-CSIC, Madrid, Spain), Koen Lauwaet (ICMM-CSIC), Gonzalo Santoro (ICMM-CSIC), Jesús M. Sobrado (Centro de Astrobiología, CSIC-INTA, Torrejón de Ardoz, Spain), Ramón J. Peláez (Instituto de Estructura de la Materia, IEM-CSIC, Madrid, Spain), Víctor J. Herrero (IEM-CSIC), Isabel Tanarro (IEM-CSIC), Gary J. Ellis (Instituto de Ciencia y Tecnología de Polímeros, ICTP-CSIC, Madrid, Spain), José Cernicharo (Instituto de Física Fundamental, IFF-CSIC, Madrid, Spain), Christine Joblin (Université de Toulouse, UPS-OMP, IRAP; CNRS, IRAP, Toulouse, France), Yves Huttel (ICMM-CSIC) and Jose Angel Martín-Gago (ICMM-CSIC). El documental, que cuenta en formato road-movie los entresijos del nacimiento de los granos de polvo en el espacio, está financiado por la Fundación Española para la Ciencia y la Tecnología – Ministerio de Economía, Industria y Competitividad y el Consejo Superior de Investigaciones Científicas (CSIC) y ha sido producido por la empresa LuzLux. 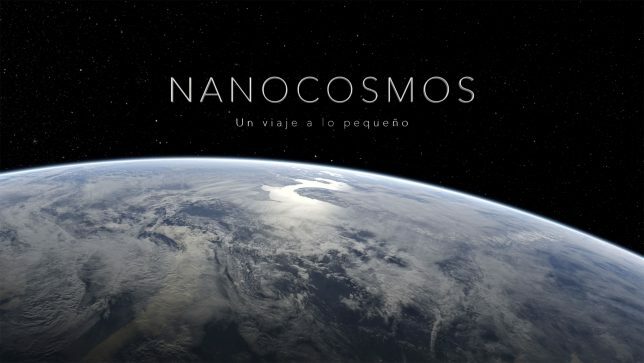 Tras seis meses de trabajo, el equipo formado por personal de CSIC y la productora LuzLux, entre otros, ha finalizado el documental “Nanocosmos: un viaje a lo pequeño”, una película de carretera que habla del reto tecnológico y humano que hay tras el desarrollo de instrumentación en el área de la astrofísica de laboratorio. 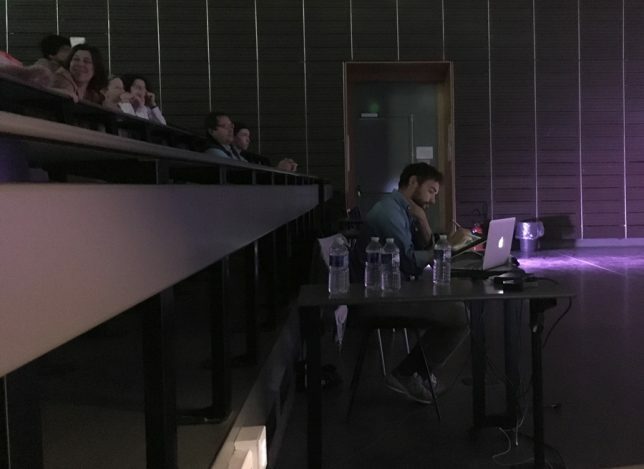 La historia se desarrolla en tres planos: el viaje del equipo de grabación desde Madrid hasta Toulouse, los experimentos de laboratorio explicados por sus responsables y el propio viaje de los granos de polvo cósmico desde que nacen en la envoltura de una estrella evolucionada hasta que pasan a formar parte de algo mucho más grande (una estrella, un planeta o, por qué no, un ser vivo). Este trabajo quiere transmitir las expectativas de los equipos que luchan por comprender este proceso, el reto tecnológico y humano que supone construir máquinas complejas y lograr reproducir en un laboratorio lo que ocurre en el espacio. El documental, de 40 minutos de duración, circulará por circuitos de cine científico y canales específicos de divulgación científica durante un año, tras lo que estará disponible en la página web de Nanocosmos. En este enlace podrán ver el tráiler que anuncia el documental, que está disponible en español con subtítulos en inglés y en francés. También hay una versión con subtítulos en español para personas con discapacidad auditiva. After six months of work, the team formed by CSIC staff and the LuzLux production company, among others, has completed the documentary “Nanocosmos, un viaje a lo pequeño” (a journey to the origins of dust grains), a road movie which talks about the technological and human challenge that lies behind the development of instruments in the area of Laboratory Astrophysics. The story unfolds in three levels: the journey of the recording team from Madrid (Spain) to Toulouse (France), the laboratory experiments explained by its principal investigators and the journey of the cosmic dust grains since they are born in the envelope of an evolved star until they become part of something bigger (a star, a planet or, why not, a living being). This work wants to transmit the expectations of the teams struggling to understand this process, the technological and human challenge involved in building complex machines whith a goal: to reproduce in a laboratory what happens in space. The 40-minute documentary will circulate along circuits of scientific movies and specific science channels for a year, and after that it will be available on the Nanocosmos’ website. In this link you can see the trailer announcing the documentary. The movie is available in Spanish with subtitles in English and French. Cone Nebula (NGC 2264) Credits: NASA, H. Ford (JHU), G. Illingworth (UCSC/LO), M.Clampin (STScI), G. Hartig (STScI), the ACS Science Team, and ESA. “Detecting the building blocks of aromatics” is the title of this “Insight” written by Christine Joblin and José Cernicharo (both NANOCOSMOS PIs together with J.A. Martín Gago) and talking about the history and importance of the work published by Brett A. McGuire et al. (“Detection of the aromatic molecule benzonitrile (c-C6H5CN) in the interstellar medium“) in the “Science Magazine” (12/01/2018). 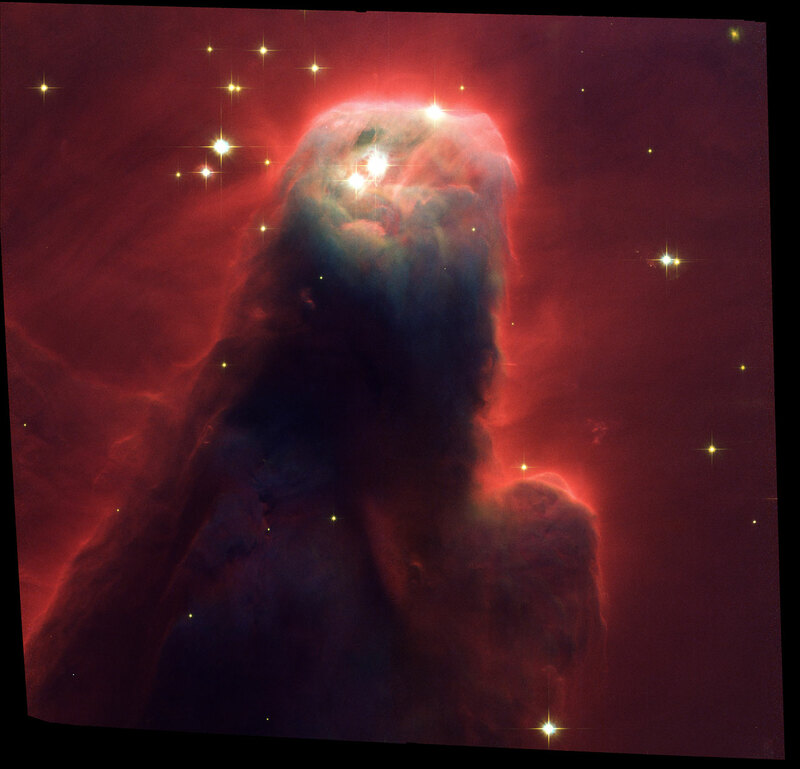 “Interstellar clouds are sites of active organic chemistry. Many small, gasphase molecules are found in the dark parts of the clouds that are protected from ultraviolet (UV) photons, but these molecules photodissociate in the external layers of the cloud that are exposed to stellar radiation (see the photo). These irradiated regions are populated by large polycyclic aromatic hydrocarbons (PAHs) with characteristic infrared (IR) emission features. These large aromatics are expected to form from benzene (C6H6), which is, however, difficult to detect because it does not have a permanent dipole moment and can only be detected via its IR absorption transitions against a strong background source (2). On page 202 of this issue, McGuire et al. (3) report the detection of benzonitrile (c-C6H5CN) with radio telescopes. Benzonitrile likely forms in the reaction of CN with benzene; from its observation, it is therefore possible to estimate the abundance of benzene itself”. Last Saturday, the 2nd edition of the “Illustrated talks” organized by ERCcOMICS took place at Jussieu Campus in Paris with the artist Lorenzo Palloni and the researcher Christine Joblin (one of our Principal Investigators) in the “Fête de la Science 2017” (Science Party). 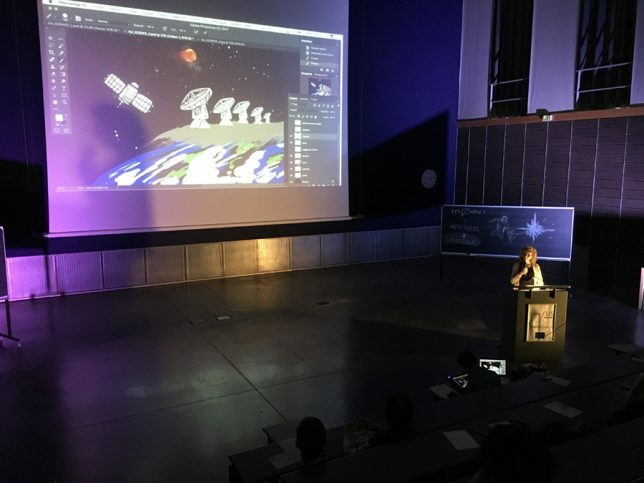 It was an amazing opportunity to share the astronomy and astrophysics behind the Nancosmos project, that has already a comic inspired in its science. This “Fête de la Science” is a celebration of science and technology and thousands of individuals get involved, providing general public the opportunity to discover the wonders of science. “Illustrated talks” are talks where the artist illustrates the scientist live while talking about the project. Congratulations for this outreach initiative! 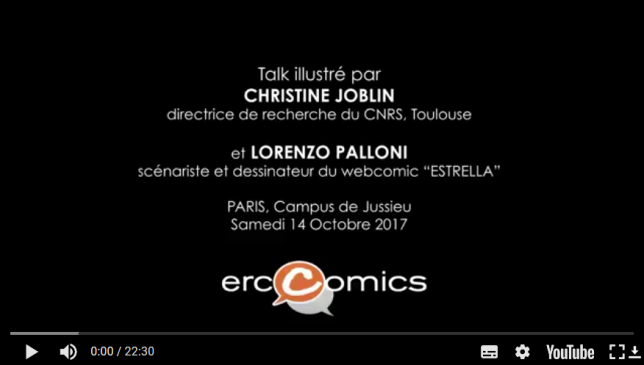 Watch the full illustrated talk (in french) by Christine Joblin (research director at CNRS Toulouse) & comics artist Lorenzo Palloni at the Fête de la Science in PARIS, Campus de Jussieu, on the 14th of October 2017. Here, some pictures from the 2nd edition of the illustrated talks with the artist Lorenzo Palloni and the researchers Christine Joblin (ERC Nanocosmos). 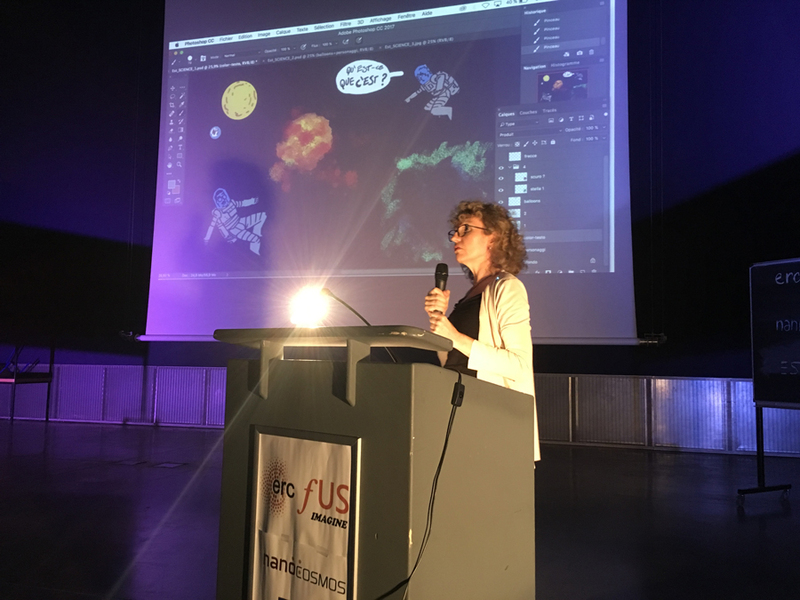 Christine Joblin, one of Nanocosmos’ Principal Investigators, participates in an illustrated talk during the “Fête de la Science” last 14th of October in Paris. “Estrella” (Star in Spanish) is the name of the comic inspired by Nanocosmos. Christine Joblin during the illustrated talk in Paris. 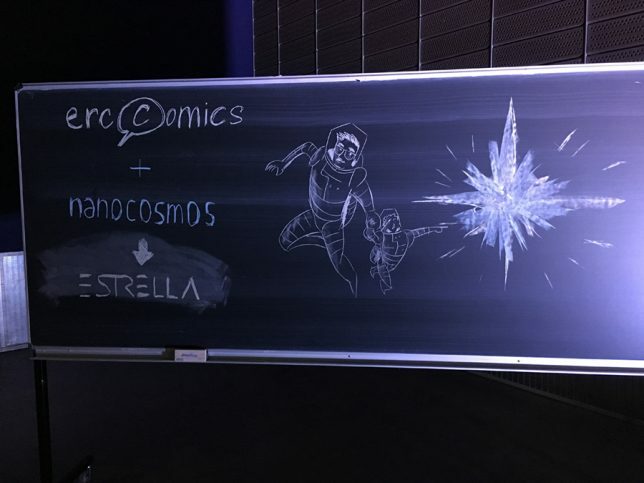 Lorenzo Palloni is the artist that gave life to the comic inspired by Nanocosmos “Estrella” and draw the stories live during the illustrated talk.